When I visited the Venetian Ridge Vacation Villas office to interview developer J. Kelly Sullivan for this story, I met him bubbling over with enthusiasm. He had just returned from his hometown of Toronto, where he was a lead sponsor of Toronto’s Ultimate Travel Show, Canada’s largest travel showcase. Interest in the Turks & Caicos Islands was enhanced by his new affordable opportunity for almost anyone to vacation in this upscale destination. Developer J. Kelly Sullivan stands in front of one of the Venetian Ridge Villa cottages. Venetian Ridge Villas is a Caribbean cottage-styled condominium community of 39 fully equipped vacation villas. It is nestled along a hillside just off Leeward Highway in Providenciales, in the central part of the island west of Graceway IGA shopping center. Because it is not directly on the beach, rental rates are shockingly low on an island where bargains are few and far between. At the same time, everything that makes Provo such a desirable vacation destination is within easy driving distance—beaches, watersports, golf course, restaurants, nightlife—yet the five acre enclave is a quiet, tranquil place to relax away from the crowd. The well-built and charming vacation villas, nestled in a tropical oasis with a pool and spa pavilion scheduled for completion in early summer, perfectly suit the value-conscious vacationer, family reunions and groups of up to 150 people attending weddings at beach resorts just minutes away. At approximately 600 sq. ft., each fully furnished Venetian Ridge Villa has everything a vacationer, short-term businessperson or “snowbird” needs to be comfortable. At One On Marlin, 35 luxury villa suites are now built, surrounded by organic botanical gardens that rival the best at any beachfront resort. Once complete, the development will boast terraced, lagoon-styled pools connected with rock waterfalls, saltwater hot springs, a poolside lounge, nature trails and O2, a full service spa that will only open to private bookings for a maximum of six guests at a time. As I toured the Venetian Ridge Villas grounds, two things especially appealed to me: the driveways and parking areas are newly paved (no muddy shoes) and the entire property seems to burst with an abundance of organic tropical fruit trees, flowers, shrubs and vegetable and herb beds, lending color, fragrance and authenticity to the visitor experience. Kelly says, “We are growing so many different species that it is hard to keep track!” There are three University-educated horticulturists on site, willing to nurture nearly any seed a visitor might bring. During our fantastical tour, I saw everything from plantain to papaya, mahogany to moringa, grape vine to guinep tree and Kelly even presented me with a fragrant pink rose plucked from a hardy bush. Kelly is quick to point out that Venetian Ridge guests have ample opportunity to patronize local businesses, infusing growth into the economy. Most all rent cars or scooters, an easy way to visit any beach, from the most-frequented to the most-deserted. (All Provo beaches are free and open to the public.) Each vacation villa is equipped with beach chairs, umbrellas, coolers and BBQs. 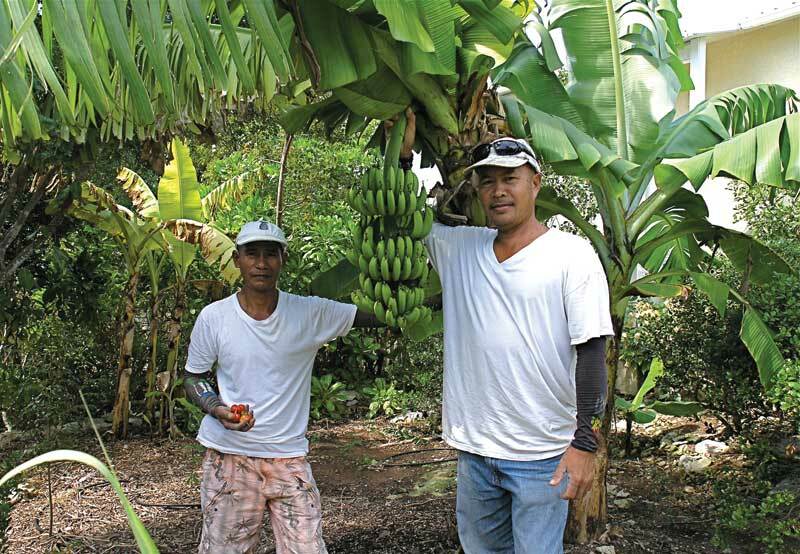 With the supermarket close by, visitors can choose to cook at home or visit the cornucopia of island eateries, taking advantage of nightly specials or entertainment as they desire. The Venetian Ridge website will soon offer new “click, pick and book” vacation packages designed around what a guest wants and nothing more. These range from all-inclusive meal plans (with vouchers for participating restaurants) to “drivin’,” “golfin’,” and “divin’” options. The “Wedding Bells & Conch Shells” package can help brides save money in lodging for groups as large as 150 people; the same concept would apply for family reunions, dive clubs or incentive travel groups. Folks with long-term financial savvy are also snapping up investment units at Venetian Ridge Villas and One On Marlin. Kelly explains that for less than $200,000, investors can purchase a vacation villa in the Caribbean. The properties will be operated as a lá carte, “just off the beach resorts,” without the restaurants. For the cost of most TCI resort condos, investors can buy multiple units, enjoy free, turn-key vacations “whenever forever,” with hassle-free management by Equinox the rest of the time. In fact, he guarantees investors a minimum 5.25% net average annualized return on investment for five years. 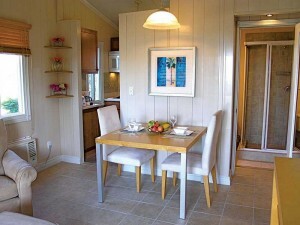 Kelly boasts, “We have investors who own Grace Bay beachfront condos. They stay there and make their money here.” Management fees are the lowest of all resorts, condo fees are less than $300/month, and TCI still has no property taxes. University-trained horticulturists Joenarie Ramoran and Jeselito Gayat help keep Venetian Ridge Villas a tropical oasis of organic fruit trees, plants and flowers. 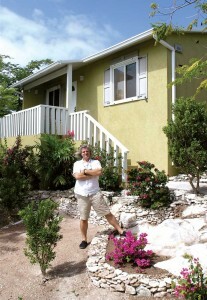 An 18-year TCI resident and Belonger, Kelly runs a vertically integrated group of businesses in the building trade that span from BuildAll, a wholesale building contractor supply house, to Turks & Caicos Housing Company, a local construction company that has built over 140 buildings, and Equinox, a development and property management company. Kelly says, “I have had the pleasure of supplying materials and contractor services to so many people here through the years, but my passion has always been development. Land is my canvas. My preference is to complement as opposed to compete.” His key to keeping prices low and everything under control has been the vertical integration of the supply chain starting with the factory and ending with a positive guest experience. Although J. Kelly Sullivan inherited the typically Canadian values of honesty, discipline and thrift from his father, he has an exotic side, too. After studying abroad in Italy during high school, Kelly, fascinated by all things Chinese, in 1984 made his way to China as an undergraduate student at top-ranked Fudan University. Kelly is quick to point out, “Although I am proud to call TCI my home, over the past 29 years I have travelled to all parts of China and lived there some 8 years to date.” (BuildAll has a small branch office in the major port city of Ningbo.) Fluent in both Italian and Mandarin Chinese, Kelly’s worldly exposure has cultured his own philosophies of life, as he embraces the “yin” and “yang” of the Occidental world. In the vacation developments (and at home), this interest spills out into designing over-the-top spas, including the O1 spa-inspired pool which will open at Venetian Ridge in Summer 2013. Kelly explains, “This is all part of creating a healthy, harmonious environment for mind and body. Our guests love the simplicity.” O1 is being built on the south side of the property, canopied by large Royal Poinciana trees, bordered by a grove of papaya trees. It includes a seven-foot indigenous rock garden with water tumbling over a grotto into the depths of a stone-lined infiniti pool and a hot plunge surrounded by different varieties of banana and plantain. The outdoor shower is made from a specially crafted slab of granite from China, bordered by blue stone and green river rocks. It will include a private courtyard for massages and meditation rooms for personalized treatments from Spa Tropique. A more luxuriant version, O2, with a cutting-edge series of hot and cold air and water treatments, waterfalls and meditation pavilion, is planned for One On Marlin. For more information, visit VenetianRidgeVillas.com or OneOnMarlin.com. For booking, call toll free: 877-941-3121.